• one descends to the skin of the chin. • two ascend to the skin and mucous membrane of the lower lip. These branches communicate freely with the facial nerve. 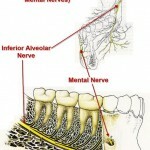 The mental nerve can be blocked with local anesthesia, a procedure used in surgery of the chin, lower lip and buccal mucosa from midline to the second premolar. 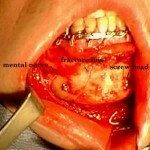 In this technique, local anesthetic is infiltrated in the soft tissue surrounding the mental foramen. What is mental nerve neuralgia? Mental nerve neuralgia is a painful disorder of the mental nerve, which may be damaged or not function properly. Mental nerve neuralgia can have many different causes. The most common cause is a complication of dental treatment. If this is not the cause, the disorder may be the first sign of a (general/systemic) malignancy. 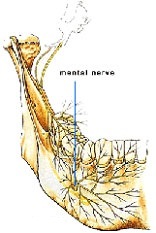 Mental nerve neuropathy (MNN) or “numb chin syndrome” is a clinical symptom of metastatic carcinoma to the mandible. MNN is defined as numbness or paresthesia localized to the chin or lower lip, and it is often accompanied by an abnormal sensation of “thickening” of the lip similar to the experience of dental anesthesia. Most cases that are not dental in origin are associated with diffuse metastatic disease, particularly with underlying lymphoproliferative disorders. The mandible is an uncommon site for metastatic carcinoma but when it is involved, the primary tumour commonly originates in the breast, lung, prostate, kidney, thyroid, ovaries or testicles. In 47% of cases, MNN precedes diagnosis of the primary tumour, and in patients with a history of cancer, MNN often indicates recurrence or progression of the disease. When MNN develops in patients with underlying carcinoma, survival is typically less than one year. 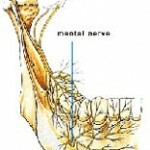 MNN is a symptom caused by dysfunction of the terminal sensory branch of the mandibular division of the trigeminal nerve. MNN is commonly due to compression of the mental or inferior alveolar nerve from a lesion present in the mandible or skull. Initially, the altered sensation is unilateral, but this may progress and cause bilateral mandibular symptoms. 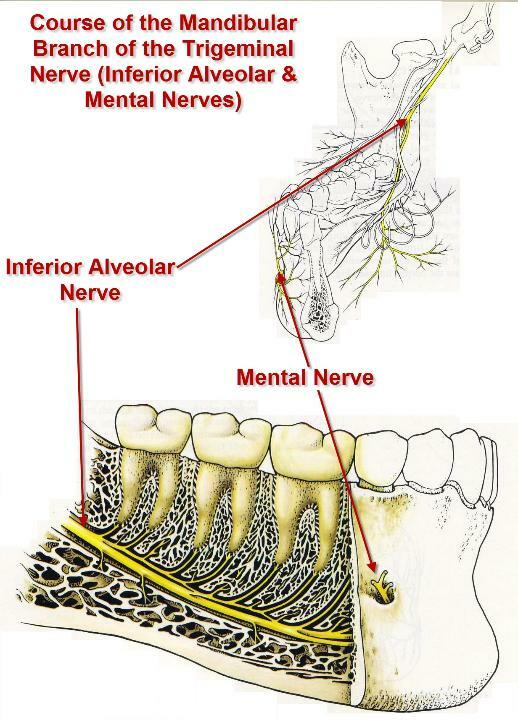 Glaser and colleagues described anesthesia and pain as the main symptoms of metastatic mandibular disease, and patients generally report paresthesia or dysesthesia in the peripheral distribution of the inferior alveolar and mental nerves. This symptom is the most consistent finding when a neoplasm is located in the ramus and body of the mandible, as was the case with our patient. The pain associated with a metastatic mandibular lesion can be severe and intense, and it may mimic a toothache, temporomandibular joint discomfort, osteomyelitis or atypical trigeminal neuralgia. MNN may also be associated with local trauma, cysts, inflammatory disorders, mandibular atrophy or iatrogenic nerve injury by dental anesthesia. Other systemic causes of MNN include neurological disorders, diabetes mellitus, sarcoidosis, amyloidosis and sickle cell anemia. The literature review by Laurencet and coworkers suggests that lymphoma and adenocarcinoma of the breast are the primary tumours most likely to metastasize to the mandible. In patients with suggestive symptoms, mandibular x-rays or panoramic films may be diagnostic. A standard mandible series includes a right and left lateral oblique, posterior-anterior (PA) view, reverse Towne’s and submental vertex radiographs. The panoramic view is a valuable screening method because it has tomographic effects and visualizes the entire mandible, both temporal-mandibular joints, and maxillary sinuses on one film, allowing for more reliable comparison of anatomic structures. In patients with a history of carcinoma, radiographic evaluation should include a CT scan of the mandible, basal skull, head and neck if possible. CT provides images of thin sections of both hard and soft tissues without superimposition. If no traumatic etiology or systemic disease is apparent, physicians should look for dental disease. Odontogenic infections and abscesses can present as intra-oral or facial swelling, which may be firm or fluctuant, with or without discharge, erythema and heat. Patients will often complain of spontaneous and increasing pain that is aggravated by heat, cold or chewing. Clinical exam may reveal tooth decay, dental restorations or both in the affected tooth. Periodontal infections may present with similar symptoms. In such cases, the gingiva may appear erythematous and edematous with deposits of plaque (white, thin) or calculus (yellow to brown or black) around the necks of the teeth. Patients with temporomandibular joint dysfunction or myofascial pain syndromes often present with intermittent or constant dull pain that may be associated with mastication (e.g., temporalis or masseter use). In these cases, cheek, temporal and periauricular pain are common, and patients may report a history of grinding, clenching and reduced jaw excursion. Patients may also have experienced their jaw “locking” open or closed in the past. Trigeminal neuralgia is characterized by sharp, often excruciating pain that is stimulated by a trigger; the patient often identifies the specific area and action that stimulates their discomfort. Patients complain of numbness of their cheek and lower lip, in combination with neuropathic pain. How is mental nerve neuralgia diagnosed? The first thing that must be done is a neurological examination of the cheek and lips. You will always be given a thorough examination by a dentist. If necessary, and if the problems did not result from dental treatment, further examinations are done to exclude other causes. Do I need additional examinations? • Diagnostic examination for other non-physical factors important for your pain, have already been done by yourself trough filling out your pain questionnaires. • If the doctor suspects other causes, he or she will refer you to an internist. What are my treatment possibilities? Depending on the cause of your pain, your pain specialist will decide whether or not to embark on physical treatment. Based on the results of the completed pain questionnaire, additional examinations can be carried out and, apart from physical treatment, other methods of treatment will be suggested. 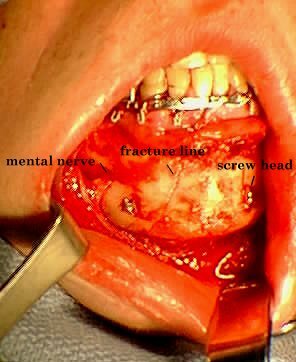 This entry was posted in Oral Surgery and tagged inferior alveolar nerve, mental foramen, mental nerve, mental nerve neuralgia, mental nerve neuropathy, numb chin syndrome, numbness, paraesthesia, sensory nerve, trigeminal nerve on December 28, 2011 by chzechze.